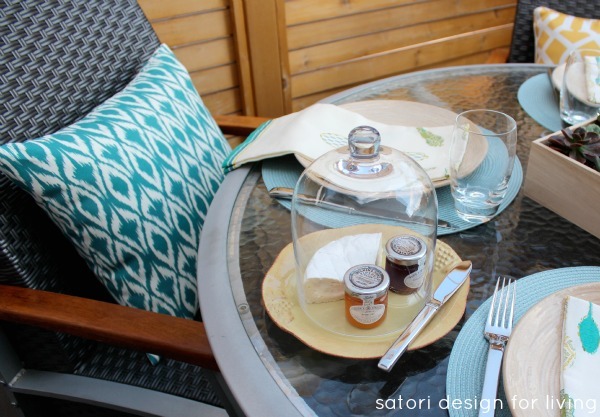 Simple tips for creating an outdoor brunch tablescape. With the warmer weather finally upon us, we’re finding ourselves dining outside as much as possible. The fresh air and warm sun are at the top of my favourites list for sure. When we added the cedar partition to our deck a few years ago, it gave us the privacy we were seeking, and it created the perfect outdoor dining space. Normally we invite friends over for dinner, but this summer I’d like to mix it up a bit and decided to create my go-to outdoor brunch tablescape. Planning ahead means we’re ready to go at a moment’s notice. The jumping off point for my decorating scheme was these yellow, teal, and green tea towels I found at Target’s opening in Calgary. 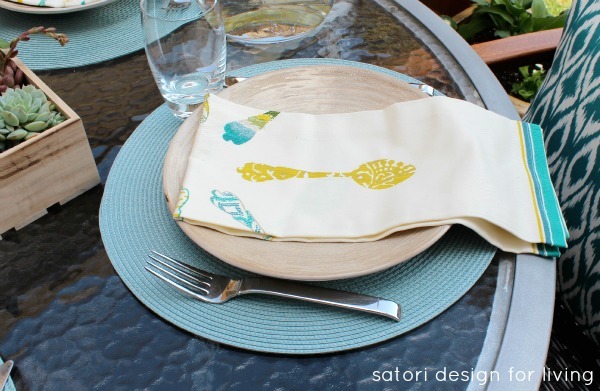 I love the graphic pattern, and thought they’d be a nice alternative to typical napkins. 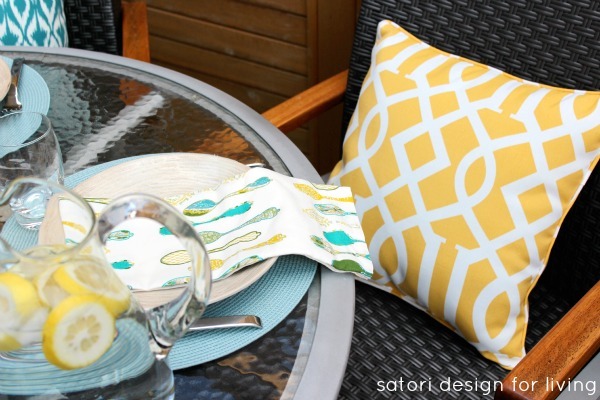 I’ve always been drawn to the combination of yellow and grey, and when I spotted these yellow trellis outdoor pillows, I knew they would bring a touch of vibrancy and life to the space. 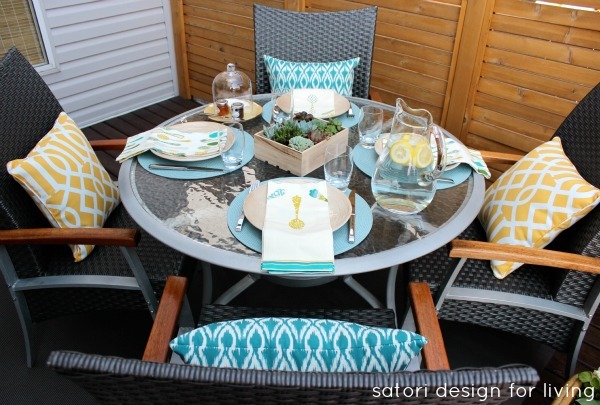 I liked how they complement the teal Ikat outdoor pillows I also picked up on my Target shopping trip. For the centerpiece, I found a variety of succulents at a local garden center and placed them in a pine crate I already had on hand. Lately I’m obsessed with these tiny plants! Surrounding the table, I planted hostas and white begonias in yellow glazed planters I purchased a few years ago. This year I wanted to keep my pots simple since the outdoor decor pieces are quite bright. 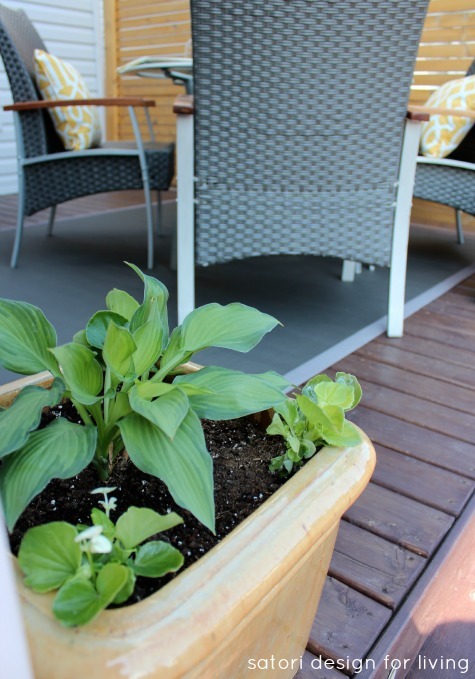 These types of plants also like a fair bit of shade, and our deck provides relief from the sun. For brunch there needs to be food, of course. 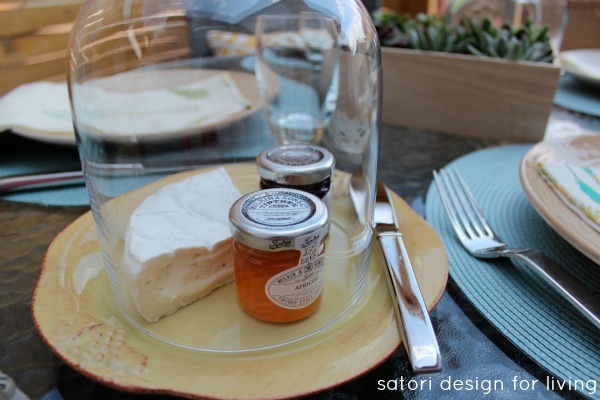 I love this little glass cloche I picked up for covering anything you want to keep the bugs and dust off. For water, I used this glass jug I found at my neighbour’s garage sale for $5. Great find! Everything else we already had on hand. It just goes to show that adding a few inexpensive pieces can really freshen up a space. This brunch tablescape has a similar feel to last year’s outdoor dining space, but this one seems more inviting with the additional layers. Do you dine outside as much as possible when the weather turns warm? 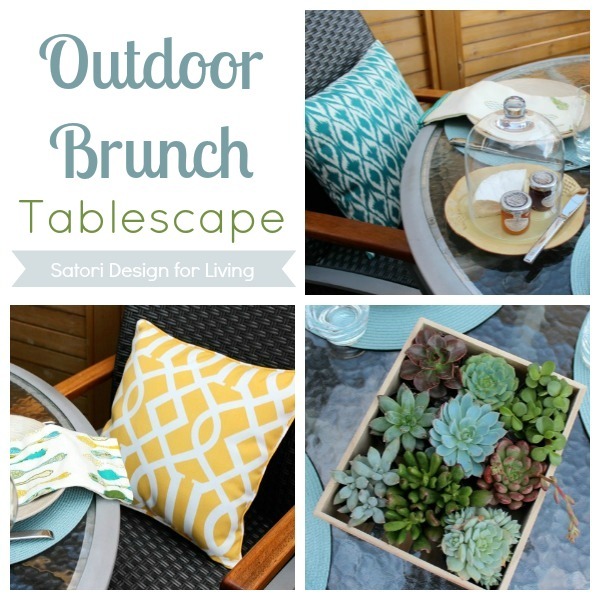 What are your favourite elements to add to an outdoor brunch tablescape? 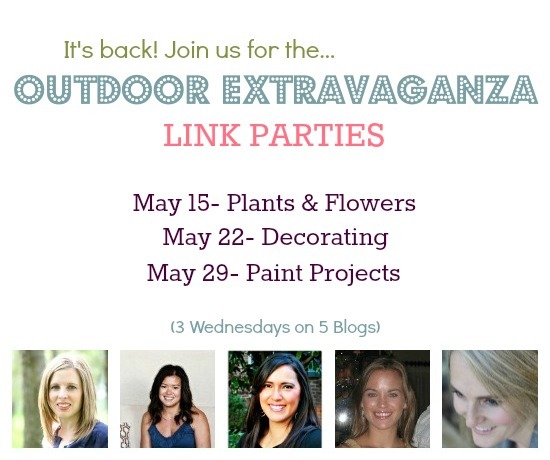 Be sure to come back tomorrow for the Outdoor Extravaganza Decorating Link Party! Perfect! So glad Target opened up! Oh those tea towels are beautiful (I’ll have to look for some too in our Target!) and they look perfect with your tablescape, what a lovely brunch setting! I love everything you’ve done here! Those teatowels are making me even MORE anxious for Target to finally arrive into our city! But until then, I’m off to find some succulents … grouping them together is fantastic! Thanks! Succulents are so pretty and easy to care for. Good luck with your project! I want to come for brunch at your house. Your table is gorgeous!! I’d love to have you. Perhaps a mimosa or two? loving the colors! 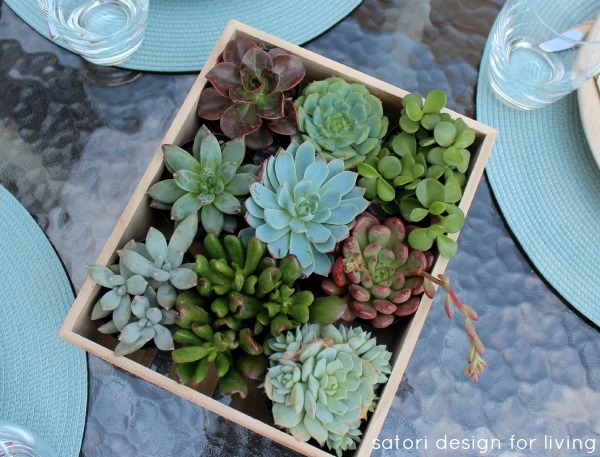 And that box of succulents is too cute! What a great table! I am loving the color selections! I will be over very soon! I love the succulent centerpiece! You tablescape is so inviting and looks great! I just found so lovely tea towels at Target on clearance a week ago, yours is so cute, I might have to go look for those. Thank you! Succulents are so easy to work with, you should definitely give them a try. Our Target just opened last week and I think I’ll be making regular trips back- there’s some really cute stuff! There’s nothing more motivating to get things done than when you’re hosting a party or event. Hope it all goes smoothly! Love the look! 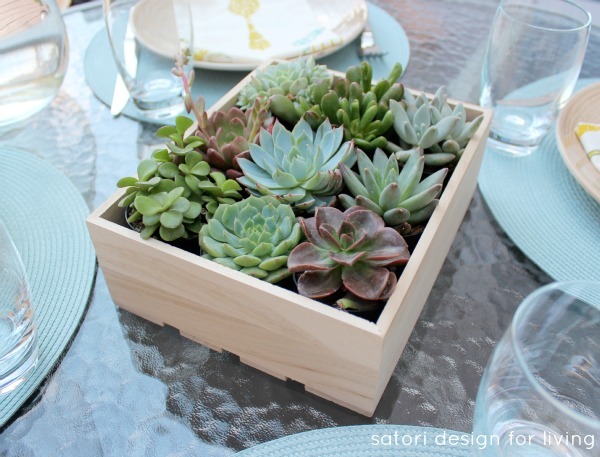 I’m really into succulents lately – I love your crate idea! I love everything about your tablescape. 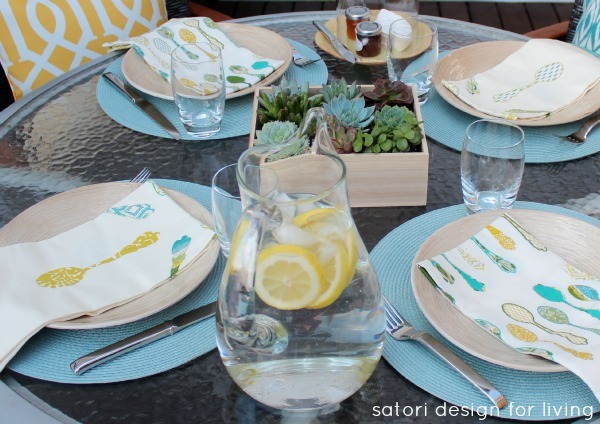 The napkins are great and I love those pillows! It’s so pretty. Don’t even get me started on Target or succulents…they are both 2 of the best things! I seriously stared at the tea towel aisle in target for one too many minutes (thankfully my toddler snapped me out of it!). I definitely could’ve spent more time in Target, but I had my husband and son with me and you know how that goes LOL! Probably a good thing though! Amazing and stunning! I love everything!!!! Those succulents though, to die for! What time is brunch!? You’re so sweet! Yes, succulents are so easy to care for- perfect for those who are garden-challenged! I’m pretty much on the same page with you with regards to everything here! 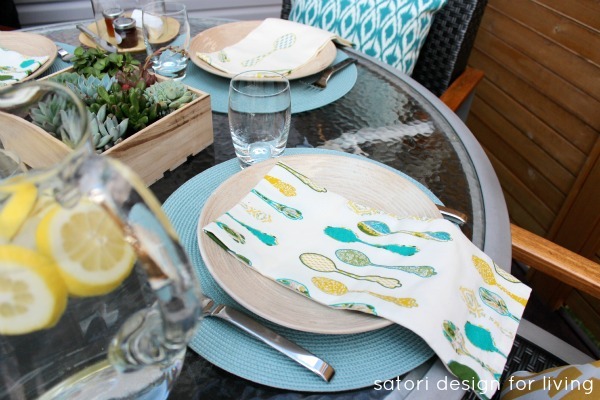 Dining outside during the summer is at the top of our list, I love succulents and your centerpiece, just a few simple purchases go a long way to update everything you have, AND, I really love hostas and begonia’s, too……. Oh, and brie is one of my many favorite cheeses. :) A very inviting tablescape, all around! Sounds like we’re on the same page. We really should be neighbors! Simply Beautiful! Those plants are gorgeous and the colors and patterns you chose are perfect! I love it!! Those pillows are fabulous and the little succulent planter is soooo adorable… I love all the different kinds you have stashed in it! Thanks Krista. So fantastic to stumble upon your blog this morning and see you’re also from Canada.Can’t wait to see more of your projects! I guess this is my first visit. OMG! I love your cushions. Absolutely gorgeous. Thanks for stopping by. Always love to see new faces around here! love your fabrics and succulents!!! I’lll bring the champagne!! Your table is lovely. I really was drawn to the succulents centerpiece! Will follow and would love a follow back. Visiting from Serenity Now. Happy Weekend!